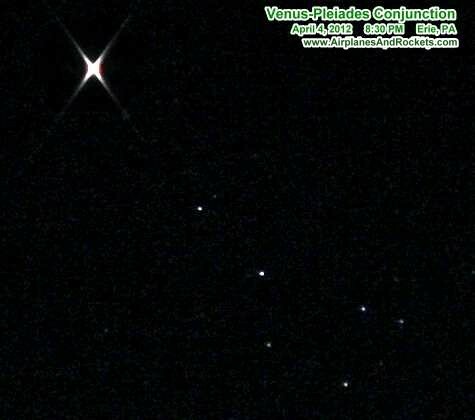 Venus had a very close conjunction with the Pleiades asterism in the constellation of Taurus. It is evidently very rare for the two to come this close together. From what I read, April 3, 2012, was the closest approach, but the sky clouded over and prevented me from getting a shot. Fortunately, the next evening, April 4, was crystal clear. This picture was made with a Panasonic HDC-SD80 camcorder mounted on a tripod. At 640x480 resolution, the optical zoom goes to an incredible 60x! It was somewhere around 40x in this shot. I could have used a photo editor to brighten the shot and bring out more stars, but then the significance of the six member of the Pleiades would be compromised. "The sister stars that once were seven, search for their missing mate in heaven."